Tuesday is my designated spinning day. I spun this. 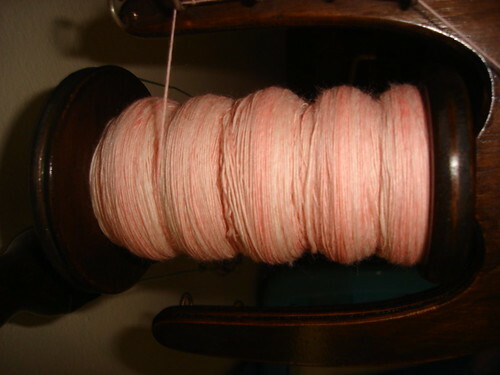 This is the pink and white section of the roving. I also measured up this. Post washing it comes to 295 grams and 488 metres. (My online convertors tells me that this is 10.425 ounces and 533.6 yards). It’s a three-ply. Unfortunately, I worked more hours than I usually work yesterday (not complaining, just stating fact) and so didn’t get any quilting done. By the time I finished work I was tired and I have learnt the hard way not to sew when I’m in that state of mind. 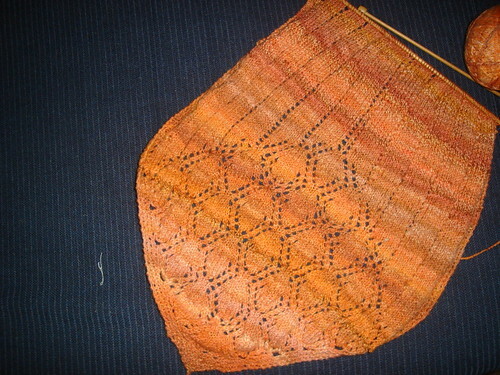 Instead, I picked up my knitting and worked on my current WIP. 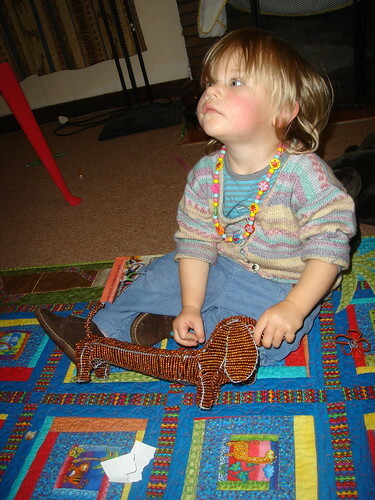 Juno, using handspun that I dyed and spun myself. I’m definitely going to be making this again. Not so sure about the striping thing going on, but it’s growing on me. Of course, it wouldn’t be a post without a gratuitous picture of Gorgeous Girl. On Sunday we went to a braai (BBQ) at a friend’s place. Gorgeous Girl had great fun with their boys, their youngest is about 18 months older than Gorgeous Girl. She was also very taken with the trampoline. 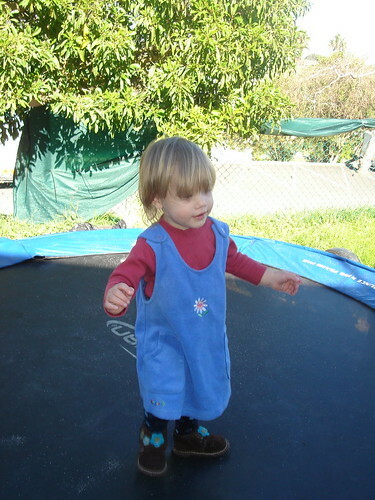 She tried out her cousins’ trampoline in Australia and so was most excited to see one here as well. 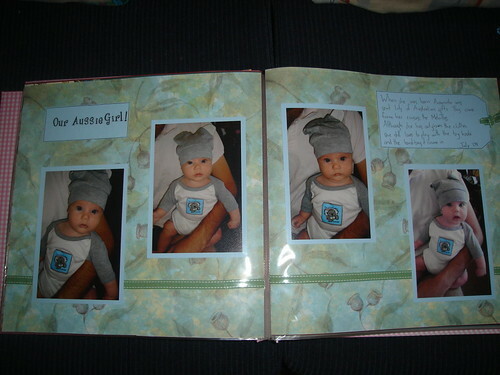 Kerin has posted pictures of some of the scrapbooking pages she did for Gorgeous Girl, and some I ‘helped’ with. You can see them here. I found some time (mostly late at night when Gorgeous Girl was asleep) to do some crafty things this weekend. My quilting group, the Free Radicals, is making blocks for each of the members. My little trip to Australia has put me way behind, so I’m scrambling to catch up. I’m so slow at making blocks for other people. Here is one I managed to finish (only 5 more to go). This person requested red, white and black. The block is Whirlpool and comes from here. My points aren’t great, but it will have to do. I won’t be doing a block exchange again. 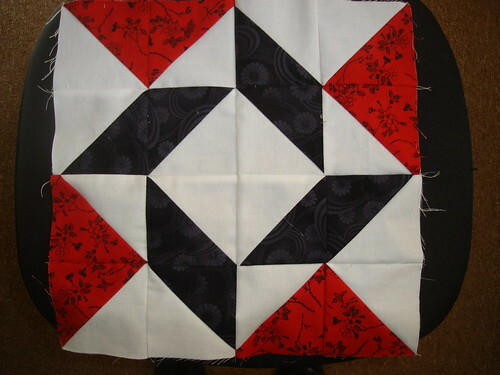 The pressure to get it absolutely perfect is too much for me and it really eats into my limited quilting time. I’m pleased with how this one turned out. This is the first 12 x 12 layout that I’ve done from scratch on my own. 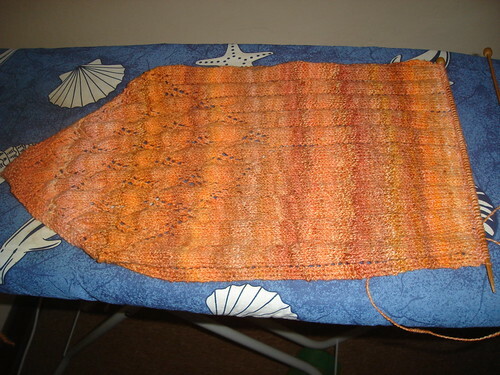 The others have been finishing off ones that Kerin started – to ease me in gently. 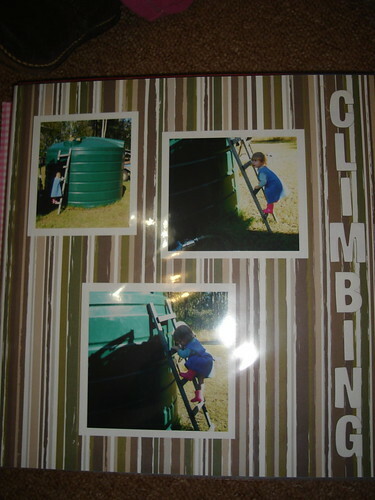 One craft that I have neglected very badly since moving to South Africa is card making. I used to make all of my own cards. My step-MIL is also into card making and Gorgeous Man and I used to go and visit a couple of times a year. The men would go fishing and SMIL and I would have a day or two stamping and making. I’d always come home with a stash of cards. Spending time with her on this trip revived my card making mojo and while we were there I made a few cards and did some stamping of images to bring back with me. These are a mix of cards made in Australia and here in SA since I’ve been home. 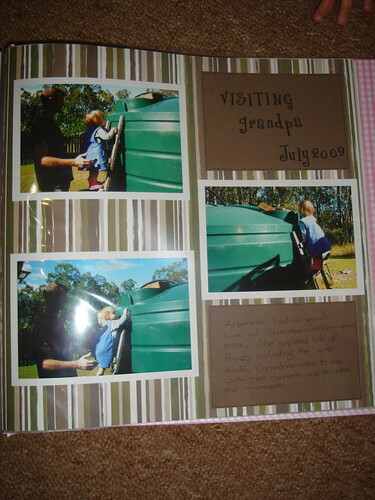 Kerin sent me home with some beautiful completed scrapbook pages, and some that were in progress. 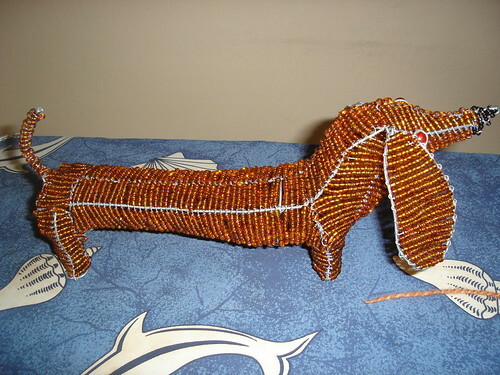 Here is one that I finished off by myself. Finally, Tuesdays are for spinning and this is what I worked on this week. This is a top that I dyed myself (all of my coloured tops I’ve dyed myself because the postal service isn’t trustworthy enough for me to order from Etsy – one way to breed self-sufficiency I guess). I’m really pleased with how the dye turned out. It’s pink and white in some sections and brown and pink and white in others. The colour is very subtle. The only preparation I did to the top was to split it length wise so that I can spin a two ply with colours (hopefully) aligining. This top is spinning like butter as well, very easy to draft. 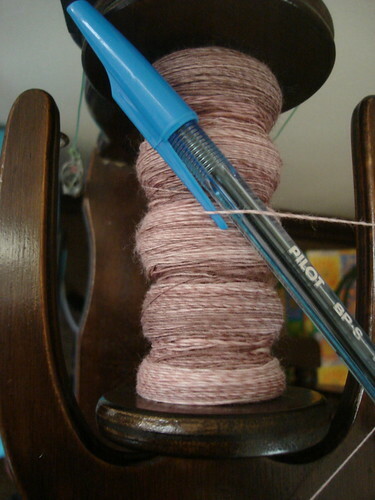 I set myself the challenge with this to spin as finely and as evenly as possible. So far so good. 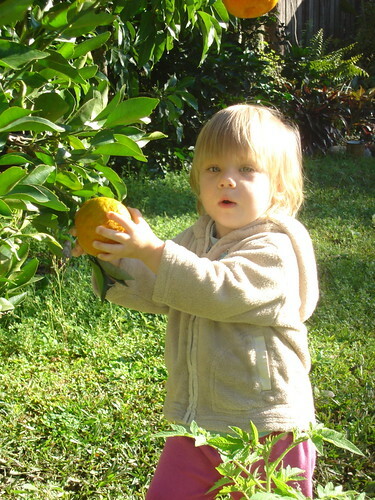 And because we can’t have a post without a picture of Gorgeous Girl, here is one of her picking the mandarins at Grandpa’s place. Thanks for the welcome back comments. I’ve been too tired and exhausted to reply to you all, unfortunately. I have to admit that I felt very, very low when we first arrived back in South Africa. The jetlag, combined with a bad cold and really not wanting to leave Australia all contributed. I’m feeling much better now, both physically and emotionally. I really do have the best husband in the world. For most of last week he would come home for lunch and then send me to bed to rest for an hour or so. I didn’t realise how much I missed just being in Australia until we arrived. I got teary watching the galahs feeding in the gum trees. There is so much that Gorgeous Man and I take for granted that Gorgeous Girl is missing out on. 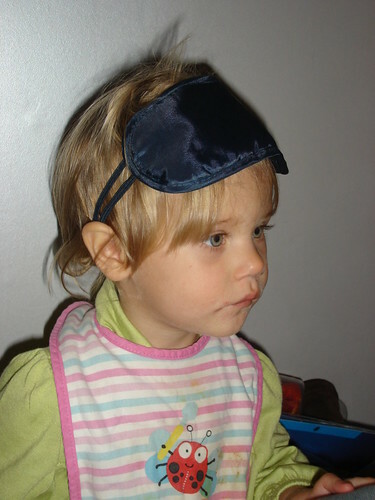 Not to mention the fact that she is growing up removed from our friends and her grandparents and cousins. Gorgeous Girl travelled really well. She had to sit on Gorgeous Man’s lap the entire way from Cape Town to Johannesberg. She was so good that we were complimented on her behaviour by our (male) seat companion. The plane from Johannesberg to Perth was the emptiest I’ve every been on. Every single person in economy class had at least one spare seat next to them. We had 4 seats between the three of us. 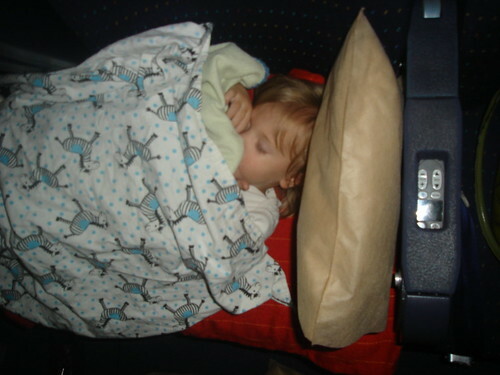 Gorgeous Girl slept for about 4 – 4.5 hours of the 9 hour flight. The flight crew on this trip were great. It rained the entire week we were in Perth, except for one day. We took advantage of that day to visit the wildlife park where my brother works. 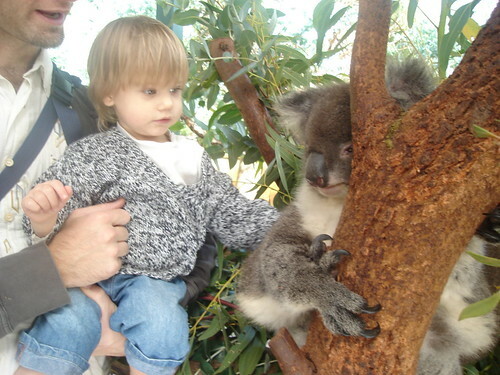 Gorgeous Girl got to feed kangaroos and pat a koala. (I made the jumper/sweater she is wearing). Gorgeous Girl also had her first ever train ride in Perth (trains here aren’t really safe for travel). She was very taken with the train. After Perth, we flew to Brisbane (we will not discuss this flight with an overtired child who only fell asleep on landing). We then drove to Grafton on the north coast of New South Wales to see Gorgeous Man’s father. Gorgeous Girl had an awesome time. This little female is wild, but comes up to the house twice a day for some bread. She is the second (at least) generation to do this. 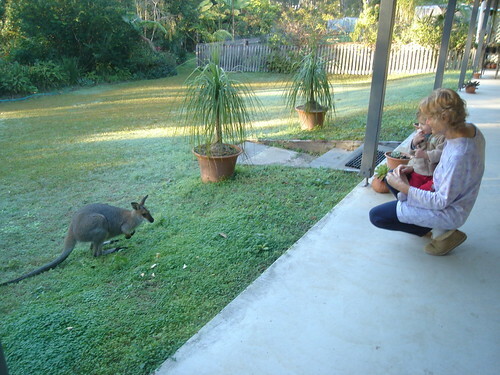 Her mother brought her when she was just a joey. She had a juvenile with her and a baby in her pouch. This is not normal in Australia, Gorgeous Man’s father and his wife live on quite a large rural property. 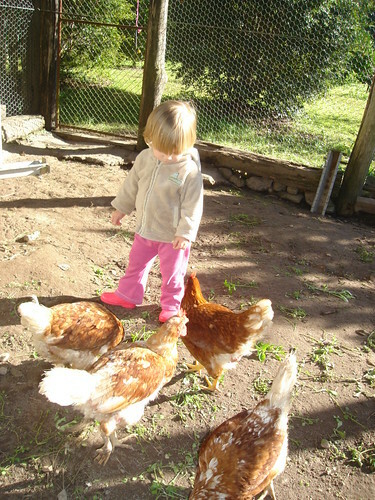 Gorgeous Girl also got to feed the chooks (chickens). 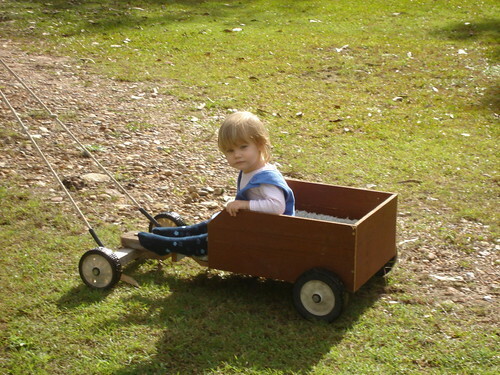 Pick mandarins off the tree and ride in the billy cart that Grandpa made. After Grafton, we headed back to Brisbane to spend some time with Gorgeous Man’s sister and her family and to see our friends. It was great catching up with everybody, but a lot of running around. One last picture from the trip home. 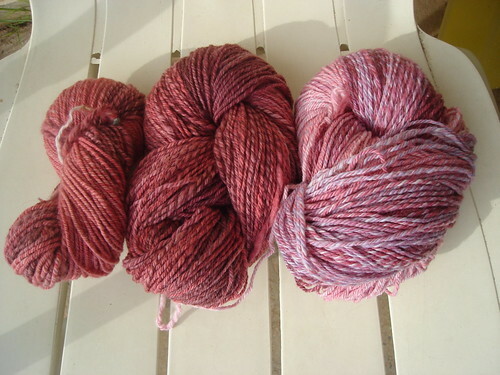 Since this is still a craft blog I’m going to leave you with some pictures of some finished objects. 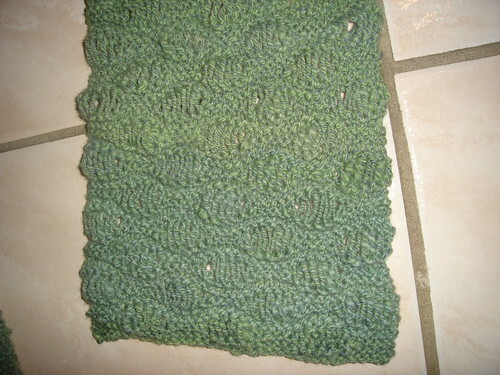 First is a scarf made from the first three ply I spun. I gifted this to my step-mother-in-law. I had trouble photographing this. 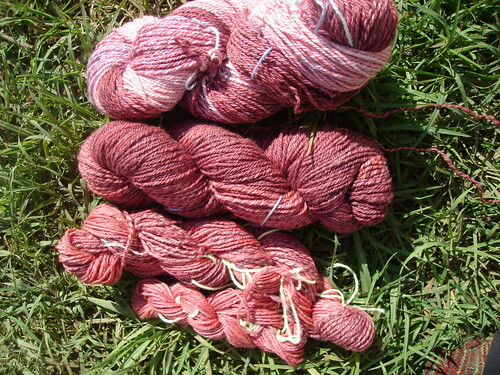 This is another three-ply that I spun before we left but didn’t wash and set until I got back. This is in the pre-washed form. So no yardage or wraps per inch yet. 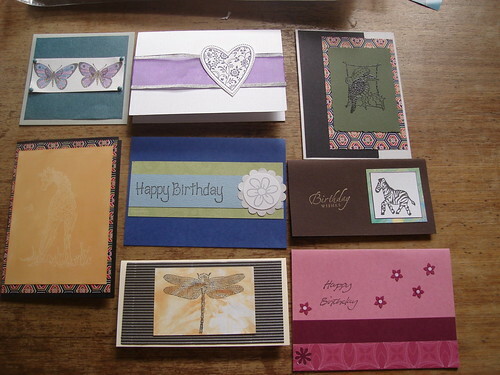 I’ve gotten back in to card making and so will have some of them and some scapbooking pages to show in the next post. We are also very excited because we’ve found a company that we can purchase a box of locally grown, seasonal organic food from. You order the box and get what they put in it. We get our first one tomorrow. Just a quick post to say we are back from Australia. We had a very lovely time, and much to our relief Gorgeous Girl travelled extremely well. There was some fabric shopping, and a ball of sock yarn also managed to make its way into the bag 🙂 I also bought a quilt kit, so I won’t need to buy fabric for the rest of my time here (unless it’s backing and borders) – sorry South African economy. I started back at work today, still feel jetlagged and have the flu. There will be a full update with pictures once I’m feeling a little more energetic.